I started breeding Bearded Collies in 1988. 30 years later I am still alive and kicking! Every time puppies are born I am excited to see the results of my combinations. I proudly bred more than 111 champions and hope to breed future champions as well. But as important as the champions are all those happy family dogs and their happy owners, who live together with their Firstprizebears Bearded Collie and daily feel the joy of sharing many happy years with their dogs, until the old age of 13-16 years. That gives me a happy feeling as a breeder. I have had many litters in the past 23years. So many have been special and so many champions have been made up. A first Special litter was my H-litter in 1993, where my famous “Hillary Clinton” come out and 5 littermates became a champion as well. Another special litter were born on 06-05-2001 by our “Very Brown” and the famous AM Ch. Windfiddlers Still Cruisin”. 10 puppies were born, 9 were used for breeding and from them 6 became a champion . Out of this litter is our most famous dog CRUFTS Winner and multi Ch. Firstprizebears Apache. Often I was asked which were my most beautiful dogs. Very hard to answer, I have bred so many wonderful dogs. On the other hand I could mix an ideal male out of “Dennehotso”, “Eminence” and “Vancouver” with a dash of “Apache”and “Shilstone Choir Boy”. 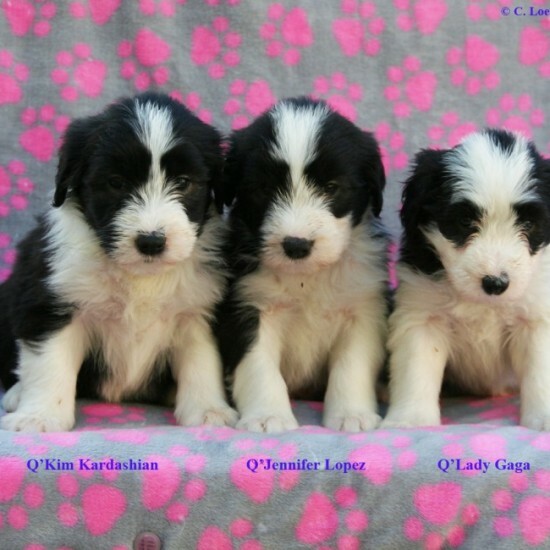 Looking at the females I could imagine a combination of “Hillary Clinton”, “Very Brown” and “Z’Tampa”, and as icing on the cake Ch.“Firstprizebears Niagara Falls”, who is the blueprint of a Bearded Collie female for me. She was breathtaking and broke showrecords. 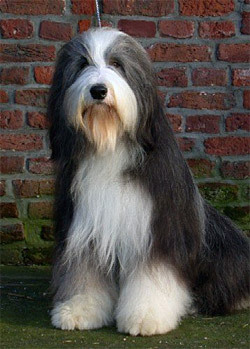 For me the blueprint of the Bearded Collie standard as a lookalike is Ch. Shilstone Choir Boy for the male and as mention already in females it is Ch. Firstprizebears Niagara Falls, but also our Ch. Firstprizebears Z’Tampa. These dogs combine the perfect measurement of heights to lengths (4:5), having these dark eyes with this melting expression who takes your soul. The movement is of greatest importance to me, and should have a long reaching and effortless groundcovering. Very social and friendly is a must. The ideal height for dogs is 53cm up to 56cm and if we have the 4:5 ratio for the length it sould be 66cm up to 70cm long. The girls should be 51cm up to 53cm, ratio length should be 63cm up to 66cm. And this is much longer as 85% of all Beardies who are at the shows this days!!!!! Not to forget a straight topline and I mean straight! And this can only come if the ribcage in long enough and the loin is short. After two succesful dates with Mr. Smith Prada showed took her eyes on his beautiful son Partout. Pups are born at 10 december.